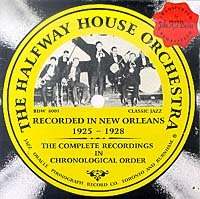 Recorded in New Orleans 1925-28. The complete output by this fine band. Albert Brunies (cnt), Joe Loyacano (tbn), Leon Roppolo (clt, alto), Charlie Cordella (clt, ten), Mickie Marcour (pno), Bill Eastwood (bjo), Leo Adde (dms). Albert Brunies (cnt), Charlie Cordella (clt, alto & ten), Bill Whitmore (pno), Bill Eastwood (bjo), Leo Adde (dms). Albert Brunies (cnt), Charlie Cordella (clt), Glynn Lea “Red” Long (pno), Angelo Palmisano (bjo), Chink Martin (bbs), Emmett Rogers (dms). Add Joe Loyacano (alto), Johnny Saba (voc). Arodin plays tin whistle on track 18. Martin plays sbs only on this session.